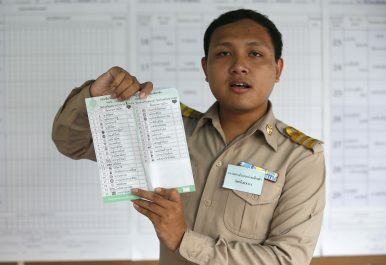 In this Sunday, March 24, 2019, photo, a Thai officer count ballot after close polling station in Bangkok, Thailand. Thai election authorities on Thursday ordered a recount of votes and new elections in some polling areas after finding irregularities in last month’s general election. Kaweewit Kaewjinda for the Associated Press.